FILE - U.S. Ambassador to South Korea Mark Lippert, surrounded by security men, waves as he leaves Seoul's Severance Hospital in Seoul, South Korea. U.S. Ambassador to South Korea Mark Lippert departed Seoul Friday with a sense of satisfaction that under his watch the U.S.-South Korea alliance was as close and strong as it has ever been. “A lot of people, including our two presidents have said the relationship, as I walk out the door, is the best it’s ever been and I take great pride in being a small part that puzzle,” Ambassador Lippert said in an interview with VOA. A former U.S. Navy SEAL who served in Iraq and Afghanistan, he became a foreign policy advisor to President Barack Obama's 2008 presidential campaign, and was named the U.S. ambassador to Seoul in 2014. Lippert resigned this week in accordance with President-elect Donald Trump’s order for politically appointed ambassadors to vacate their posts before he takes office. The U.S. ambassador was highly regarded and popular in South Korea for his engaging style. He was often spotted casually interacting with South Korean people at baseball games, and as he walked the streets of Seoul with his small children and two dogs. His children were born in South Korea and he gave his first son a Korean name, Sejun. It became more difficult, however, to maintain his approachable lifestyle after a knife wielding ultra-nationalist Korean assailant attacked and wounded the ambassador in March 2015 while he was attending a forum on Korean reconciliation near the U.S. embassy. The assailant later said he attacked the ambassador to protest the ongoing U.S.-South Korean joint military exercises, which he saw as an obstacle to the unification of the two Koreas. After the attack, Lippert tried not to allow the increased security around him change his lifestyle too much. Most importantly, he said, the help he received from Korean doctors and hospital staff following the attack, and the outpouring of public support served to further deepen the strong ties of friendship and affection he already felt for the Korean people. “What that did is basically solidify a long-standing belief that I have, which is, in these moments you cannot let the extremists win. You cannot let one or two individuals overcome the wishes of the great majority of the Korean people,” he said. FILE - South Korean men watch a TV news program reporting U.S. 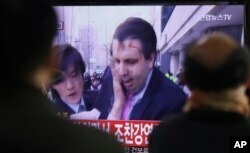 Ambassador to South Korea Mark Lippert injured in a knife attack at Seoul railway station in Seoul, South Korea, March 5, 2015. Among his achievements, Lippert cites increased U.S. security cooperation with South Korea, along with improved trilateral cooperation with Tokyo against the growing North Korean nuclear threat. He also said that during his time in Seoul, the free trade agreement (FTA) with South Korea was more fully implemented. It should be noted, however, that some American companies still complain of excessive and confusing regulations being imposed on U.S. imports to stifle foreign competition, without overtly violating the FTA. And Lippert was quick to point out what he considered was the worst policy failure under his watch. “The regret is easy. Congress’s failure to ratify and implement the Trans Pacific Partnership (TPP) was a great disappointment,” he said. South Korea was not a member state of the TPP free trade agreement, which included the U.S., Japan and 10 other Pacific Rim countries, and accounted for 40 percent of the world’s economy. Lippert said the TPP, however, would have given the U.S. a great deal of economic leverage in the region as it set higher standards for labor conditions, and for environmental and anti-corruption regulations. The departing ambassador remains optimistic about the future despite the increasingly tense situation with North Korea, that in the last year conducted two nuclear tests, 24 missile tests and is threatening to launch at any time an inter-continental ballistic missile. And he discounts comments made during the presidential campaign by President-elect Donald Trump to withdraw U.S. troops from South Korea unless Seoul more fairly reimburses Washington for defense sharing costs, and to possibly allow South Korea and Japan to acquire their own nuclear weapons. Since Trump’s election victory, Lippert said, the president-elect and his security advisers have stressed their support for a strong U.S., South Korean military alliance. When asked to send a final message to the North Korea people, Lippert reiterated President Obama’s call for unification of the Korean peninsula. “I think the key message to all Koreans is that we want to see a unified Korean Peninsula one day, under a democratic government, free market economy, and in a government that respects the basic universal human rights of its people. So that’s the dream, we share that dream.” he said.